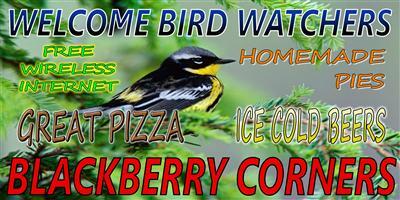 Blackberry Corners Stop in for a great meal! Thanks for visiting BBCTavern.com. We have great pizza, cool beers, and the best people you’re likely to meet. We look foraward to seeing you here soon. We are open every day but Tuesday. Breakfast is served Friday through Sunday. We also offer a "Buffet Style" breakfast on Sunday mornings. It includes all of our usual breakfast favorites, and it's always All You Can Eat! Stop over on a Sunday morning to try it out. Brenda's interview by 13ABC during the "Biggest Week in American Birding".